With the urbanisation of the world’s population proceeding apace and the equally rapid urbanisation of poverty, urban theory has an urgent challenge to meet if it is to remain relevant to the majority of cities and their populations, most of which are outside the West. 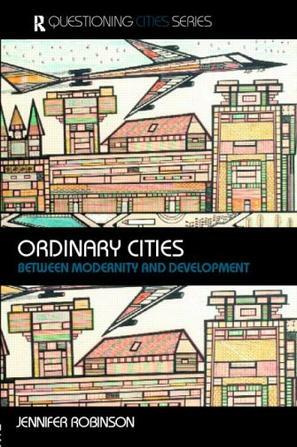 Ordinary Cities establishes a new framework for urban studies, one which considers all cities to be ‘ordinary’. It cuts across a longstanding divide in urban scholarship between Western and other kinds of cities, especially those labelled third world, and contests approaches which categorise or rank cities. these previously separate academic literatures and policy debates, the book traces the outlines of a post-colonial approach to cities. It draws on evidence from a range of cities, including Rio, Johannesburg, Lusaka, New York and Kuala Lumpur to ground the theoretical arguments and to provide examples of policy approaches suitable for a world of ordinary cities. This groundbreaking book argues that if the futures of cities are to be imagined in equitable and creative ways, urban theory needs to overcome its Western bias. The resources for theorising cities need to become at least as cosmopolitan as cities themselves, drawing inspiration from the diverse range of contexts and histories that shape cities everywhere.